Originally published in Amateur Cine World April 1941. James Cruze was a film actor until 1914 when he began directing for Jesse L. Lasky's Famous Players organization (distribution - Paramount Pictures). His early successes included "The Valley of Giants" (1919, with Wallace Reid), "Terror Island" (1920 with Houdini) and "The Old Homestead" (1922). Then came "The Covered Wagon," completed early in 1923. He proceeded with many successes in films of very diverse types, making about five a year, including "Ruggles of Red Gap" (1923, with Edward Everett Horton, Ernest Torrence), "Merton of the Movies" (1924 with Glenn Hunter, Viola Dana), "Beggar on Horseback" (1925 with Horton, Esther Ralston), "The Pony Express" (1925 with Wallace Beery, Betty Compson, Ernest Torrence), "Sons of the Sea" ("Old Ironsides") (1926 with Charles Farrell, George Bancroft), and the talkie"The Great Gabbo" (1929 with von Stroheim, Betty Compson). Most of these will be recalled and will indicate the director's versatility. It is, however, worth pointing out that his chief flair was for character touches and comedy "asides," which in the case of "The Covered Wagon" occur, for the most part, in the goings-on of Ernest Torrence and Tully Marshall. Cruze had also a habit, noticeable throughout "The Covered Wagon," of filling the whole screen with action over and above what was actually required for the shot so that added realism resulted. In this connection, his favourite camera position was the standard American mid-shot, often from a rather higher-than-normal viewpoint. The camera was, of course, used in the detached, objective manner, but this effect was lessened by the action-content referred to above. Karl Brown was his cameraman for years, their combination receiving bouquets from time to time merely on account of the above factors. Thus, in the Cinematographers' Roll of Honour in the October 1925 "American Cinematographer," second place goes to "Beggar on Horseback" (First was "Don Q, Son of Zorro" third was "The Lost World"). "From time to time the Western film was stripped of its fictitious trappings and was raised to the standard of an epic. It lost its story and became a reconstructed record of some great past achievement. Two examples of this have been mentioned, John Ford's "The Iron Horse" and "Three Bad Men," but the pinnacle was reached in Cruze's "The Covered Wagon." This was a film that combined the essence of the Western with the cinematic knowledge of Hollywood - a film of the men and women who set their faces and their wagons to the West in the giant trek across the plains." The version available is about 60 percent of the original, the chief losses being the prairie fire sequence, repetitive character touches that increased the human appeal of the members of the wagon train (especially of the banjo-playin', terbaccy-chawin' young Jed Wingate) and the usual consequent continuity jumps. But above all, the vast spaciousness of the original is missing, and the bunched-up effect might lead one to consider the film, if viewed carelessly so that its subtler touches were missed, as not much more than "another good Western." The Wingate train is first introduced at Westport Landing, ready to start with its ploughs for the fertile Oregon 2,000 miles west. Out West, Indians are shown, antagonistic, with a captured plough. The Wingate train is then joined by the Liberty train from Missouri, and the trek starts. Birth, Death, Defeat and Personal Conflict visit the trains, culminating in their separation at the River Platte, the crossing of which is one of the big scenes. There follows the preparations for the wedding, and then, with the wagon train parked in a deep arroyo, the terrific fight with the Indians. Then again the train splits, some branching away to seek gold in California, the rest proceeding as planned to Oregon where they settle successfully. The film closes with the logical and satisfactory clearing-up of the romantic angle. It will be seen from this brief synopsis that the material is indeed vast in scope, and it is interesting to note the devices used to keep the narrative thread running clearly. Thus we have the antagonism of Will Banion and Sam Woodhull offset with their mutual love for Molly Wingate. The several attempts of Jackson to "finish off" Woodhull, the necessity for Bridger to be drunk, and, in addition to the natural link of the characters in the trains, the recurring use of the song, "Oh! Susanna." The film was mostly shot on location in Snake Valley, Nevada. The film opens with a well-written title indicating the epic nature of the journey, followed by the locality title, "Westport Landing - 1848 - since called Kansas City." A descriptive long shot shows several covered wagons. Then comes a close shot of Jed Wingate playing his banjo, the music being superimposed . . . the chorus catches the spirit of the vast trek into the unknown. I'm going out to Oregon wid my banjo on my knee." This close shot has background action which, while in no way specifically necessary, adds realism and is typical of James Cruze's direction. A mid-shot of Molly Wingate seated in a wagon follows. Then a title describing the gathering of the covered wagons, then a vast long shot of the wagons, then in mid-shot the eagerness to start without the overdue Missourians. Jesse Wingate is introduced, examining a plough. A short sequence, linked by the plough, shows Indians menacing the movement towards the West. The sequence ends effectively with composite fade consisting of a normal fade combined with a double vertical wipeout. Then Mrs. Wingate talks to her husband, and young Jed comes up saying, "Here's her mule, Pap," so the family is introduced. Follows the introduction of Molly Wingate and Sam Woodhull and the hint that Molly is not really in love with him. Then, in a finely arranged long shot through gauze with a hole in the centre, the Liberty train approaches. There is a rush forward, the Wingates being shown waving in a long shot. In another vast shot, the train parks in a circle, the time factor being compressed by intercutting with the applauding members of the Wingate train. A title introduces Will Banion, and for emphasis his name is repeated in a dialogue title as he meets Jesse Wingate. Wingate introduces Woodhull, and antagonism is immediately fixed by the suggestion that Banion lost his commission in the Army. We next see young Jed Wingate with an uncouth individual whom Banion introduces as Jackson who knows every inch of the trail to Oregon. Jackson thereupon remarks, "An' as sech, I'd say from th' way this outfit is jumbled up that he ought t' git Will Banion t' captain ye." But Banion is appointed to herd the loose stock in the rear, Woodhull to captain the Liberty wagons. A child has broken the head off her doll, and Banion, pausing to effect a repair, is joined by Molly. So, simply, they are linked, and the romantic thread is hinted at. TITLE. 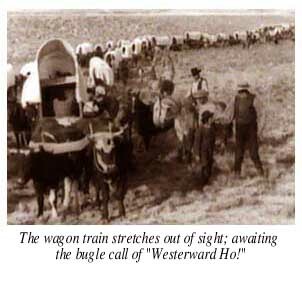 "On the 24th day of May, 1848, the mightiest caravan that was ever to crawl across the Valley of the Platte awaited the bugle call of 'Westward Ho!'" L.S. Lined up, and stretching right away out of sight in the top corner of the picture, stands the wagon train. The Wingates are near the camera. . .
M.S. Wingate says to his son . . . TITLE. "You've got your wish, Jed. You kin crack th' first whip for th' big jump-off." M.S. Jed takes the whip, spits, and . . .
L.S. . . . cracks it. The train sets off. Again one remarks on the vast action content of the long shot. The cracking of the whip could have been far more simply done in mid-shot against a background of the leading wagon only, but Cruze desired and achieved spaciousness and realism with his huge background to this piece of action. The start of the train is well pictured in several detail mid shots. A title indicates the passage of two weeks, and the giving-up of the struggle by many - and this is shown with dramatic restraint by means of a mid-shot of Wingate against a wagon that is moving away back. 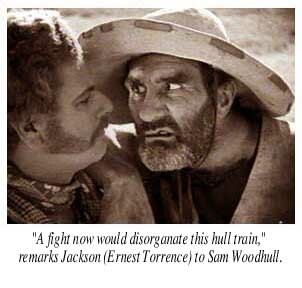 Then in long shot, Wingate and Woodhull return to the head of the train where a discussion is in progress with Banion and others, obviously regarding the need to proceed in spite of setbacks (though no subtitle is used). Molly comes up and asks to ride Banion's horse and is refused on the grounds of danger, but Woodhull eggs her on to "show him." M.S. He helps her into the saddle . . .
L.S. The horse bucks and bolts, men scatter . . .
C.S. Banion turns to the nearest horse and . . .
L.S. . . . mounts and rides after her. F-L.S. (wagon train in background). The two horses approach the camera, and Banion lifts Molly up beside him at full gallop. L.S. He sets her down as the others ride up and jumps down beside her and catches her as she staggers . . .
C.S. . . . and holds her in his arms. . .
Then Jackson (sprawled over his horse) looks at them with a look full of meaning, and Wingate comes up and angrily pulls Molly away. He cuffs young Jed and drags him away - and Woodhull and Banion quarrel about the horses - and Jackson prevents some dirty work with a gun and explains that they can fight when the river Platte is reached. The sequence is filmed with sparkling, crisp detail, the camera facing directly towards the sun, shadows being lifted by means of huge reflectors. Meanwhile there is a funeral. The travelers stand around respectfully. One detailed shot epitomizes their simple reverence - a girl plays a violin. In a well-grouped mid-shot, the last words of the service are read, and the dust of the plains fills the grave. Then a man drags a doctor from the edge of the crowd and hastens him away to attend the birth of his son - and in close-up Wingate waves on the train - and in long shot his action is concluded, and the train moves forward. MIX to close-up of wheels and plodding feet. So, in simple progression of ideas, are linked the fundamentals of the epic journey - death, birth and, in spite of all, progress towards the journey's end. At night, the Wingates are shown looking rather depressed, and Banion and Jackson lead a merry crowd over to cheer them up. The "Verginny Reel" is danced in a riot of colourful movement, Banion having grabbed Molly as partner. These scenes are beautifully lit by flares located at the "camp fires" backed up by subsidiary lighting from the generators which were taken on location by the company. Infectious gaiety pervades the whole party. Then Woodhull tells Wingate that Banion was convicted of cattle stealing; so Wingate warns him to keep away from Molly who, when he, therefore, abruptly leaves her, protests she does not believe the charge. At last the train arrives at the River Platte. The Indians run a horse ferry, but cost and time prohibit its use. Woodhull suggests fording, but Banion dramatically jumps his horse into the river to demonstrate its depth. He then offers the counter suggestion to proceed up the river as far as the cottonwoods - then caulk and timber the wagons to make them float. Inevitably, and thus welled-up-to in the story construction, the Banion-Woodhull fight follows. This is well directed and acted in the traditional American style, reactions of the onlookers being intercut. Halfway through it becomes "all in." The suspense factor is used in one shot from behind the crowd. Then Banion gains mastery but refrains from carrying out Jackson's bloodthirsty exhortations. Woodhull staggers away, full of deadly venom. Molly is thrilled at the victory. Having ferried across, Woodhull refuses to pay the Indian. . .
C-M.S. the Indian asks, gestures; Woodhull, on horse, draws gun . . .
L.S. . . . and fires. The Indian falls. Woodhull rides away. In the background other Indians come into sight, running towards their murdered leader. Fade out. This is well arranged, the approaching Indians subtly suggesting an inescapable vengeance. The action next advances to the point where Banion's train has already crossed the river, and Wingate's train has practically finished preparations for crossing. The first wagons start across while Mrs. Wingate, in a touch of comedy tinged with pathos when she is told that useless furniture must be dumped to save weight, exclaims, "Don't you call my mother's walnut bureau useless! Put it right back in the wagon!" Magnificently, the horses and oxen swimming and the wagons steadily floating, connected by single guiding ropes, the great train proceeds across the river. Detail shots show the loose herds swimming; individual wagons almost stuck at the bank, saved by tremendous effort; oxen swimming wildly in a circle, momentarily out of control. The stereoscopic brilliance of the photography is remarkable. A fine light is portrayed in the water surface, most of the shots being taken towards the sun. Meanwhile Banion and Jackson find Woodhull - the only survivor of the Indian's revenge. He staggers up to them as they look down at the smoking remains of the two wagons. Again, the sun is used as backlighting, its rays throwing up the smoke into stereoscopic relief as a horse walks past. Jackson, foiled of an opportunity to shoot Woodhull as though "the Injuns had done it," is sent back to inform Wingate. He does so and, in addition, remarks to Molly . . . TITLE "Will didn't say so, but I'll give you his regards - and you didn't say nothin', so I'll take yours back to him." C.S. . . . he says and ambles away . . .
L.S. . . . leading his horse, Molly looking after him . . .
C.S. . . . very thoughtfully . . . Face out. "Jim Bridger, you ol' jack-rabbit!" remarks Jackson next day when this lone trader with his wagon meets the Banion train and joins them. In the other train, Wingate finds a buffalo skull left by the Mormon leader, Brigham Young. This, incidentally, is the genuine article and is preserved in the Historical Museum at Salt Lake City. Then comes the buffalo hunt, full of sweeping action - with Jackson armed with bow and arrows - Bridger making a kill with a hand-knife - Woodhull taking a shot at Banion, then riding into a swamp from which he is rescued by Jackson - who in turn is only just prevented by Banion from pushing him back into the swamp when he realizes it is Woodhull he has rescued. This sequence touches the wit displayed by Cruze in his later films. It is all directed and played with a fine gusto and photographed with a sparkle eminently fitting to the subject. Fort Bridger is reached by Banion a few miles ahead of Wingate. The train is shown arriving. Then two figures walk out as wagons proceed past the entrance. Bridger introduces them - his wives to Banion and Jackson. Then he enters his fort and from Joe Dunstan hears the secret that gold has been discovered in California and the message for Banion that he has been reinstated and his name cleared. Then Jackson comes in, and they send off Joe Dunstan (backwards on his horse) - and for old times' sake have their shooting match. Each pots a tankard on the other's head from across the courtyard. There is genuine humour and more than skin-deep subtlety and satire - and there is neat filmic construction and shot time - and the acting of Ernest Torrence and Tully Marshall is of a vintage that will live just so long as there is a print of "The Covered Wagon" to show and a projector with which to show it. "The Bioscope" of 13/9/1923 wrote: "Lois Wilson and J. Warren Kerrigan, who portray the two sweethearts, are both admirably natural. The outstanding performance of the picture, however, is Ernest Torrence's study of a fierce-mannered but soft-hearted frontiersman - a character in which are epitomised the fine qualities and indomitable sprit of the courageous marchers." Torrence will be remembered for "Tol'able David" (1921 with Richard Barthelmess), "The Hunchback of Notre Dame" (with Lon Chaney, late 1923), and "Steamboat Bill Jr." (1928 with Buster Keaton); and talking in "The Unholy Three" (1930 Jack Conway, with Lila Lee and Elliott Nugent). Tully Marshall was the High Priest of Bel in the Babylonian section of "Intolerance" with Constance Talmadge (1916, by D.W. Griffith) and appeared in, and nearly "stole" such films as "The Merry Widow" (1925 by Erich von Stroheim with Mae Murray and John Gilbert) and "The Torrent" (1926 with Garbo by Monta Bell). The final point of interest about the shooting sequence in which Messrs. Torrence and Marshall shine so brightly is the subjective use of the camera in the shots looking down the gun-sights. Altering of focus neatly conveys the muzziness and its clearing away. Bridger, sobered up by the shooting, cannot remember his message for Banion, but tells him of the gold discovery. Meanwhile the Wingate train arrives, and in a great, sweeping long shot the wagons go down into the arroyo hard by Ford Bridger. There Molly and Sam are to be married. Bridger suggests that Banion should head his train to California and promises to get "lickered" again to recollect the message. And so Banion gives the order to his train, and it winds on under a sky hopeful with fleecy clouds. In the foreground, alone upon her horse, Molly watches it go . . . slow fade-out. 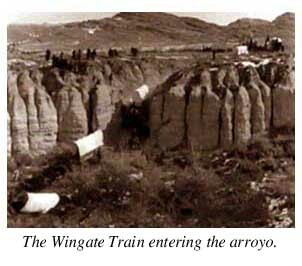 The huge arroyo, a vast hollow in the plains bounded by sheer cliffs, just contains the entire Wingate train. The whole is shown in long shot that night by campfire light. In her tent, Molly has on her bridal dress. Her mother fusses typically. Sam is being admired by bridesmaids. The atmosphere is instantly conveyed by these three deft shots. A bison is being roasted whole for the wedding feast. In close-up, Molly stands lost in thought. Then, at the back of her tent appears Bridger. With her nodded permission, he scrambles in (again, note this shot is full of background action - fires and crowds watching the roasting), and explains, "Ye mustn't marry Sam Woodhull - leastways not until I get drunk enough t' recollec' what I've got t' tell ye." She therefore produces the medicine, and he drinks . . and drinks . . while suspense is raised by calls to Molly from outside. Lois Wilson is really very polished in her playing of this scene. Though she never achieved headline fame, she is remembered for sympathetic leads such as in "The Vanishing American" and "Once a Gentleman." At last Bridger is "lickered" enough to recollect his message about Banion, and so Molly decides to go to him. But the menacing forms of Indians approach the arroyo. In the foreground of a long shot into the arroyo, an Indian shoots an arrow. . .
C.S. It pierces Molly just above her heart. Bridger grabs her. L.S. Anxious crowds surround them. . .
C.S. Bridger (transformed into a leader) shouts. TITLE "Put out them fires! Barricade! . . .
C.S. he shouts . . .
L.S. The crowd disperses to do so. M.S. Woodhull starts to pull out the arrow, but Bridger stops him, draws out his knife to cut it out. M.S. Bridger has finished the operation . . . Molly is carried to her wagon. Deft direction and well-timed cutting make this sequence memorable. The montage was by Dorothy Arzner who later won fame as one of the very few women directors, being best known for talkies with Ruth Chatterton. At dawn the Indians attack - but overnight Jed left the arroyo in an attempt to reach Banion for help. The fight with the Indians is on a terrific scale and handled in a manner beyond praise. James Cruze has to be credited, in addition to technical directorial skill, with a gift of generalship that stands alone in the history of the cinema. It must be remembered that he had actual personal charge over his three thousand players, a charge far more difficult than at first sight appears. Every movement, position and arrangement of these people and the wagons and stock depended upon his decision. The main location, in the Utah desert, was known as Camp Cruze, three months being spent there. Fort Bridger was specially built to be beside the arroyo, the chosen spot for the Indian fight. In directing the thousand Indians, Cruze had the assistance of Tim McCoy, who later starred in Westerns. The fight is shown in the routine manner of turbulent long and mid-shots, with intercut details such as the arrow penetrating the Wingate wagon, where the mother tends the injured Molly. Bridger and Jackson are in the thick of it, the former isolating a wagon fired by a firebrand hurled from above. Then, traditionally, as things look black, the Banion train gallops to the rescue, Jed to the fore. The Indians are routed. Jed clubs a particularly sinister specimen who was entering the wagon. And after it all, Wingate refuses to let Banion see Molly. Bridger is injured, and his wives tend him. Jackson arranges to stay at the fort till he recovers. The Banion train pushes on. The Wingate train follows later as the first fall of snow comes. Bridger is recovered and sees them off with the remark to Molly, "Wish I could get some good licker! I forgit if I remembered t' tell you what I forgot t' tell Banion when I was too sober to remember." Then, near the journey's end, the greed for gold splits Wingate's train. The real settlers proceed with Wingate on the Oregon Trail. The rest, their ploughs discarded, head for California led by Woodhull. In long shot across the plains, the train divides. In a finely composed last shot, abandoned ploughs in foreground, camera tilted to secure a better composition, the Wingate section winds into the distance. And at last they come into the fertile Oregon - and with unaffected simplicity they kneel to give thanks. Then Jackson traces Banion and delivers Molly's message that she will be waiting for him in Oregon. Banion has bags of gold dust. While he packs, Jackson cooks himself some bacon. Woodhull comes to the cabin, bent on revenge. He throws a stone, and Banion goes to the door . . .
L.S. Banion at door, Woodhull takes aim . . .
M.S. . . . takes careful aim . . .
M.S. Banion at door - through the window behind him looks - Jackson, firing a shot, munching bacon . . .
M.S. (circular mask) Woodhull lies dead. C-M.S. Banion very thoughtfully re-enters the cabin . . .
M.S. (within) Jackson stands, munching, looking rather embarrassed. He remarks . . . TITLE. "Sorry, Will - knowed ye was set on sparin' that critter, but some bacon grease got on my finger an' it slipped." And then before their handshake, he carefully wipes his hand on his coat. This sequence is superbly handled, obviously from a carefully prepared scenario. The disposal of Woodhull is logical. Alan Hale did well with his character, carefully avoiding melodramatics. He is still at work, one of the famous band of featured players who save many a "stellar vehicle." We affectionately remember him in "The Sea Hawk," "Gentleman Jim" (both with Errol Flynn) and "Manpower," Raoul Walsh's excellent 1942 melodrama with Marlene Dietrich, George Raft and Edward G. Robinson. He also directed a number of lesser films and played in "The Four Horsemen of the Apocalypse" (1921) as Karl. The excellently worded titles also merit attention. The satisfactory convention of a plain background for spoken title, and the simple design of a rope at the top and right hand borders of continuity titles, is adopted. The final sequence is set in the garden of the Wingates' home in Oregon. Sunlight fills the scene, and great trees lend depth. The covered wagon is seen by the house. Molly comes forward as Banion rides up. He alights and stands at the fence. Wearing a black suit and bow and holding a top hat, in close-up he looks into the distance with an expression of anguished piety. It is hardly credible that Cruze meant this to be taken very seriously. A shot of Jed and the banjo fittingly recalls with a title the song, "Oh! Susanna" - which tune, by Stephen C. Foster, should be used as a theme-link in planning a musical accompaniment to the film. Jesse and Mrs. Wingate stand happily at their front door. The film fades out on C-M.S. of Banion taking Molly in his arms. And there, successful, happily united and settled at the end of the rainbow, we leave no mere group of painted actors, but a band of pioneers we have come to know and respect. Note: The War, the West and the Wilderness (Knopf, New York, 1978) by Kevin Brownlow contains a chapter on "The Covered Wagon" which includes an interview with Karl Brown.